United Yacht Sales New Jersey would love to guide you through a personal showing of this 43' Sea Ray Sundancer 2009. This yacht for sale is located in Cape Coral, Florida and priced at $349,000. For a showing please contact us by filling out the form on this page and we will get back to you shortly! The 43 Sundancer comes standard with twin Cummins MerCruiser QSB 425 diesels (425 hp - 313 kW) mated to Zeus drives, individually articulating pods that offer up to 15 percent better fuel economy and 15 percent faster top speeds than regular inboards. 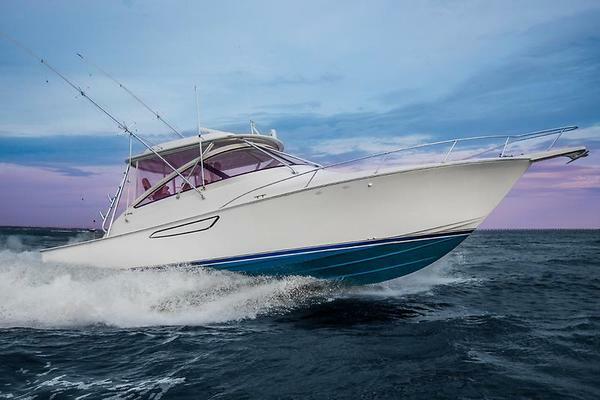 Plus, the Zeus-equipped 43 Sundancer provides a more comfortable ride because gear noise and vibration are significantly reduced.Above the waterline, the 43 Sundancer is everything that discriminating boat owners have come to expect from the definitive express cruiser series on the water. It starts with a trademark reverse sheer line, below which are two oversize hull windows and 10 portlights. A hardtop integrates seamlessly with the windshield for the ultimate in weather protection and climate control (16,000 BTU helm air conditioning/heating is optional), yet you can still let the sun shine in thanks to two retractable skylights.The captain will enjoy that sunny warmth from a double-wide helm seat with flip-up bolster and armrests. It slides and adjusts vertically in front of the gel-coated dash with SmartCraft VesselView Display and MerCruiser digital throttle and shift. To port, guests can lounge on the big L-Shaped bench. The seating options continue in the cockpit, which boasts a U-Shaped lounge flanking a convenient fiberglass table; a wet bar opposite features a solid-surface countertop, sink and ice maker or you can opt up to the removable flat screen TV, stainless-steel barbecue grill and refrigerator.At its heart, the 43 Sundancer is a boat that will make owners feel comfortable in any situation, whether it be driving, docking, entertaining, or cruising with friends and family. And since it comes with a free membership in the Sea Ray Owners Club, which offers great money-saving benefits and endless fun experiences like owners rendezvous and dock parties, the newest sport yacht will have ample opportunity to show off its slick handiwork. Below deck, the 43 Sundancer features a functional (and absolutely gorgeous) split stateroom plan, each with a wood privacy door. The forward master pampers owners in an island-style bed, from which they can watch the flat screen HDTV with remote DVD player.Cruising couples will be amazed at the storage under the berth, in gunwale cabinets, in two hanging lockers, in the floor and they'll also love the individual head and shower compartments, port and starboard, both with tile flooring.The mid-stateroom has two twin beds that convert to a queen, so it's perfect for kids or grown-up guests. Along with a hanging locker, overnighters here will appreciate a private head and shower compartment; the vanity is separate and includes a solid-surface countertop, mirror, sink and storage.In between the two staterooms, the salon and galley have all the modern indulgences of a refined seaside condominium. There's wood flooring and Ultraleather HP seating; a 26-inch flat screen HDTV with DVD player and stereo with six-disk CD changer; wood blinds and high-gloss cherry interior (either regular or dark). The galley is designed to make life as easy as possible for the onboard chef, sporting designated storage for cutlery, plates, and glasses. Full stainless-steel appliances add more than a touch of luxury.